Hey Everyone! Lisa here! One part of special education that is often forgotten about is gifted education! 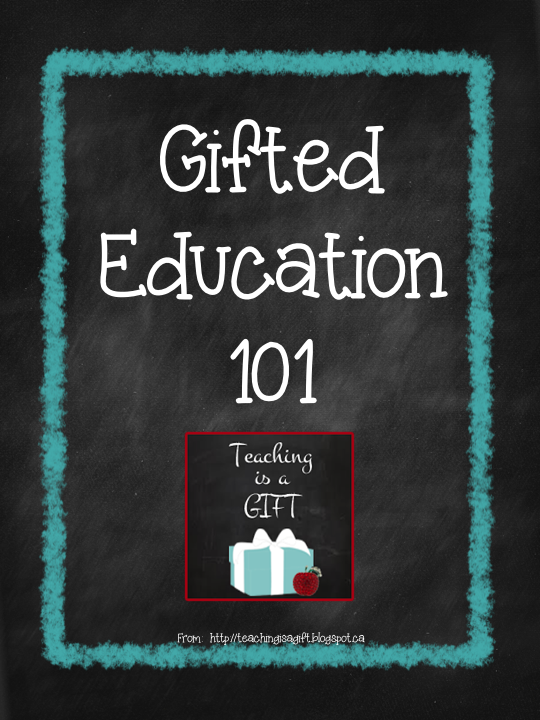 As a special education teacher, I've learned that sometimes the gifted ones can sometimes be the most challenging to teach because they don't follow the normal structure of education and curriculum plans. Please welcome our guest blogger Sydney who is a gifted teacher in Canada. She has some great information to share! My name is Sidney McKay and I am a full time teacher of students in a gifted ISP (intensive support program) in Toronto, Canada. I also write a blog called Teachingisagift. 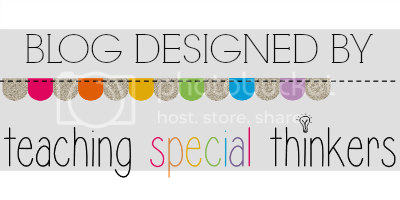 I am honoured to be a guest blogger for A Special Sparkle Today. I would like to say a BIG thank you to all the author's of A Special Sparkle for allowing me to share my experiences with your audience. Gifted students are as diversified and individual as any other group of students. As discussed in a previous post, the gifted students in my district have been identified through psycho educational testing. On the overall scoring a student needs to be in the 98th percentile in one area - either perceptual or reasoning. The student is then offered placement at a local school within their home school area. In my school, the gifted intensive support program begins in fourth grade. Often when I am talking with other teachers or parents, one of the most frequent questions I am asked is, "How is teaching gifted students different?". 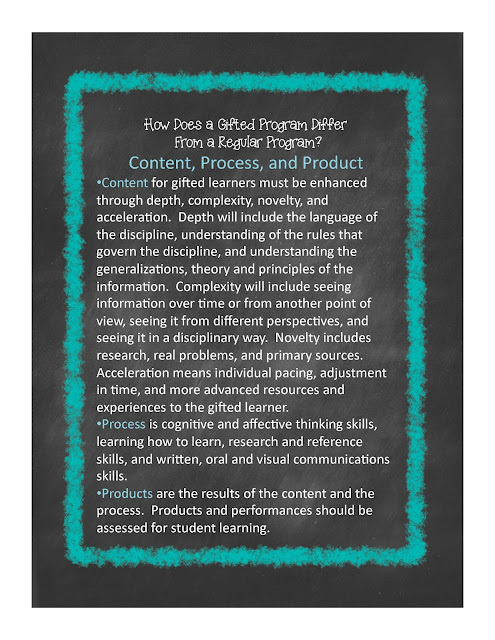 We have a parent evening each year for the incoming students and this is some of the information my team shares with the parents about delivery of program for gifted students. As you can see in the graphics above, there is a lot teachers can do to differentiate content. One thing teachers in my school board cannot do is teach curriculum material which is not within the scope of our grade level (advanced acceleration). In the Toronto District School board, we have been instructed to teach the content which has been mandated by the Ministry of Education for Ontario. A lot of parents and teachers assume that teachers are going to teach expectations from the grade(s) ahead but we are not permitted to do so. Assessment and evaluation of student progress must be based on the expectations in the Ontario Curriculum. This may differ where you teach or where your child attends school. The teachers in the gifted program at my school use the strategies listed above for content differentiation to assist in meeting the student needs as identified in their IEP (Individual Education Plan). Being the sixth grade teacher (our school has a gifted program for grades four to six), it seems to make the most sense that if the students come to me with mastery of some concepts, I would compact the curriculum for them to avoid reviewing basic expectations which can lead to boredom for many students. To compact more effectively I use diagnostic tests and assessments to determine what students know before I begin to do any in depth planning for units of instruction. In some areas such as mathematics (where my students tend to get extra tutoring, belong to math clubs, compete in math competitions, etc. ), I do a fair amount of compacting to meet the needs of my students. Some groups of student possess a lot of content knowledge and others need some review. Once I have conducted appropriate diagnostic assessments, I create units based on the curriculum expectations for the grade and what the needs of the students are. When students demonstrate a high level of mastery I need to plan a program which will stimulate and help them expand their thinking. I am fortunate to have 7 laptops in my classroom, and access to a full computer lab. This access to technology has allowed me to introduce computer programs such as Geometer's Sketchpad to keep students engaged. Programs like GSP allow students to explore typical textbooks concepts in a more hands-on and engaging fashion. The Geometer’s Sketchpad® is dynamic software created for the teaching of mathematics. 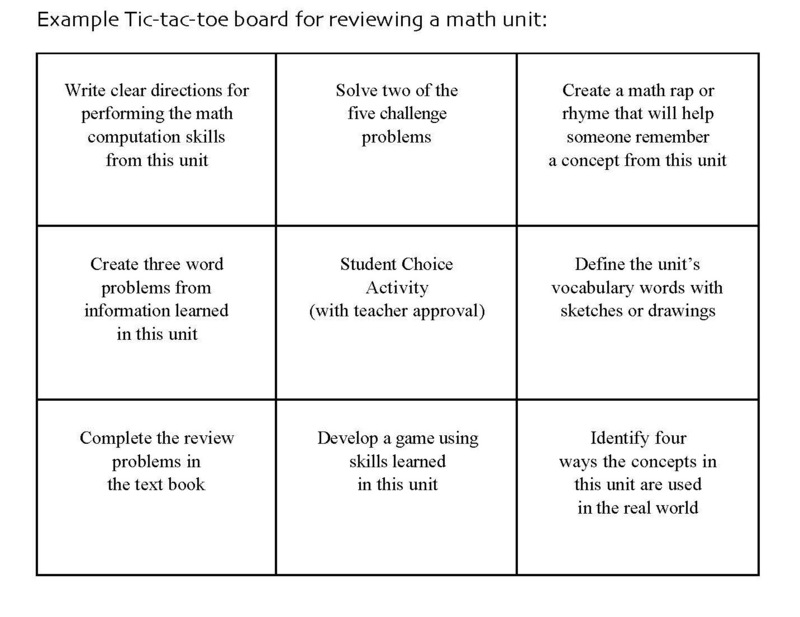 It can be used by students from as young as third grade right up to college aged. 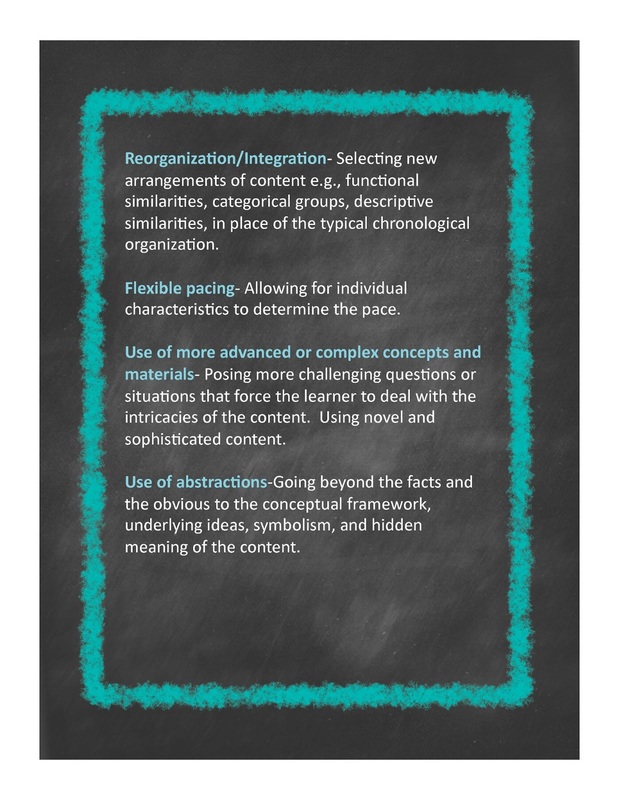 It provides students with a highly visual way to learn about new concept, and reinforce previously taught materials. In my experience students have been highly engaged using this software. Students can manipulate the software to explore a wide variety of mathematical topics which cover numerous strands in the curriculum. are ideal for small group work, individual exploration, and whole class instruction using a data projector or interactive whiteboard. 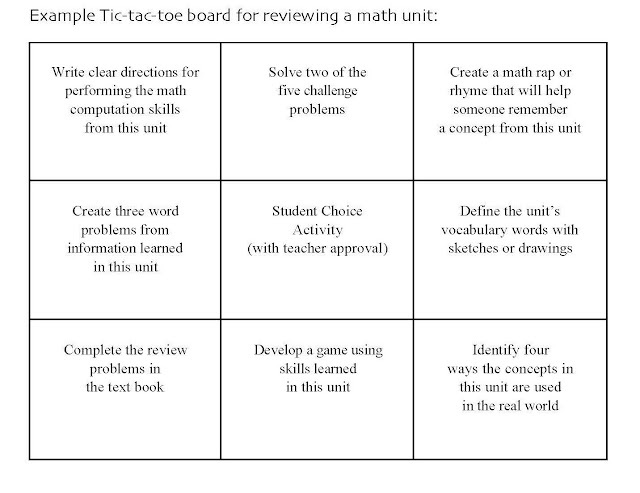 Another way I differentiate content is through the use of CHOICE boards which can help students focus on seeing content in a different and novel way. I have used choice boards with success for several years now. One note of caution though. I have found that you need to clearly explain to students what the criteria for success will be before you allow them to begin to work. The books by Laurie Westphal which I referenced in my choice boards post (click on link above) are a great resource for this. 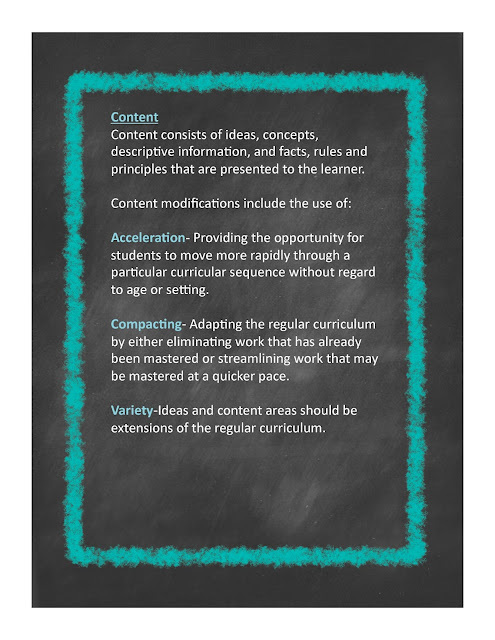 These are just a few of the many ways I modify curriculum content in my program to meet the needs of my gifted students. I assure you there are many more techniques and strategies which work well. You can read more about my work with students on my blog. The next post in my Gifted Education 101 series on Teachingisagift will focus on program differentiation through process. I hope you will join me!